Down the road from the cabin is the Ontonagon River with some viewing areas off the trail system and off the highway, etc. The Ontonagon River comes from Cisco Lake (just down Cisco Lake Road from the cabin driveway) which is part of the Cisco Chain (15 lakes). Then, the Ontonagon River goes through a variety of terrain and has a beautiful waterfall called Kakabika Falls (other waterfalls in the area also). The Ottawa National Forest is behind the cabin and along areas by the cabin. Out the driveway is the trail system for fourwheeling (ORV ATV UTV) and snowmobiling (sledding). And, much more in the area (keep reading). **The area around the cabin years ago was called Stickley (see the pages of old time pictures and history of Stickley and area on this website). The cabin is between Watersmeet, MI and Marenisco, MI (west of Watersmeet) in the historic Stickley area. A logging & lumberjack, gangster, mining (iron & copper), railroad history area with many historic stories. And, the cabin as named Stickley Lodge Getaway is based on logs-sticks-historic name Stickley-fun for family, friends or groups. Some people refer to the cabin as Stickley Beaver Lodge or Stickley Lodge. Cabin could sleep approx. 16 (or just have more room for gear and to relax). *Pets Allowed: (owners responsible for their pets and party of guests pets and liability). Only $29 fee (one fee for the entire stay for all pets). Just one fee (not per pet or not per night per pet). Misc. pet dishes to use in side cabinet. *Bathroom with tub shower unit, instanteous hot water heater, window for fresh air, shelf with products, hooks for towels and robes, table to put luggage piece on, mirror and cabinet, toliet plunger and misc. cleaners, etc. *Five Sleeping Areas: Bedroom 1: Queen log bed, chair, nightstand, lamp, alarm clock, fan; closet, small table; computer working cabinet with doors; glow in the dark stars; branch decor light fixture; blinds and curtains; electric fireplace unit; Bedroom 2: Queen log bed, chair, nightstand, lamp, alarm clock, fan; branch decor light fixture; electric fireplace unit; curtains; bark wall decor; door to outside; Bedroom 3: two sets of full size bunkbeds (with log branch bedframes), chair, table, lamp, alarm clock, fan, closet; electric fireplace unit; trees painted on walls; blind and curtain; branch decor light fixture; Basement Sleeping Area 4: sleeper sofa, lamp, table, fan, bench and also a folddown cot and set of twin size bunkbeds (with log branch bedframes); fouton, windows with blinds and leaf design valances; door to outside; electric fireplace unit; Livingroom Sleeping Area 5: three sofas; items from livingroom such as fan, table, etc. OTTAWA NATIONAL FOREST BEHIND CABIN (look at markers, platbooks and maps for landlines): The area just behind the cabin (Ottawa National Forest) has been included in select cut and cutting. This will be great for wildlife including grouse (partridge), turkeys, coyotes, bear, birdwatching, deer, moose and more. Hunters, nature lovers will all appreciate the changes of the woods. National Forest markers and marks on trees to look for. Cabin is also on acreage (parcel is rather a rectangle with corners approx.). Could use area platbook to make sure of parcels, National Forest areas and more information on area. More hunting or pictures on Fall website for cabin (listed on this page). Coyote hunting currently in 2017 listed as all year. GEM AREA: Just west of cabin is one of Upper Michigan's few GEM Areas. These are areas being managed for grouse habitats with walking trails. Hunting grouse can be done on and off trail. This area is called Blue Bill Creek. The area is toward Pomeroy Lake and Tenderfoot Creek (check GEM Maps). WILDLIFE, FORESTRY THEME: Unique, theme, fun cabin with log-branch-stickley décor, some branch trim around doors and walls, and furniture, and items regarding wildlife in area including beavers in meadows-lakes-rivers (and how they help habitat for other animals, birds, etc. ), fun facts for families and friends, fun DVDs-movies-books-coloring pages-displays-unique décor-games-recipe(s)-creative wall art-stories of wildlife and their fun antics of real happenings. Some plates, glasses, etc. with prints of trees, leaves, etc. Acreage with cabin and w/Ottawa National Forest behind cabin. Go for nature exploring, picture taking, tree type locating, and more. OUTSIDE OF CABIN: Tent sites and sand, camper area & circle driveway. Sand areas for children to play with sand toys. Picnic tables, chairs, charcoal grill(s), firepit, mosquito zapper (area is sprayed for bugs but zapper helps also), outside white string party lights, outside games to use (such as bean bags and safe jarts). Privacy with woods. CLEANED AND DISINFECTED: Cabin is cleaned, disinfected with a variety of cleaners. Cleaners, etc. to use also for guests (not responsible for injuries, etc.). MATTRESSES AND PILLOWS: Mattresses in cabin have mattress covers to protect between guests, pets, dustmites, etc. Pillows have protective covers also and are sterilized every so often. Mattresses are sprayed every so often also. Furniture is steam cleaned and sprayed every so often. BLACKTOP ROADS: Cabin is off of black top roads (not gravel). East to find off highway. CELL TOWER: cell tower just down the road helping with reception for cell phones and emergencies. BOAT LANDINGS: boat landings at Cisco Lake (15 lake chain) just down road from cabin on Cisco Lake Road. There is also another boat landing on Clearwater Lake just down Cisco Lake Road also. There are other boat landings on the Cisco Chain also. Lake Gogebic boat landing that is closest is on the southern side of the lake (could take Stagecoach Road). Beatons Lake (just a little northern of the cabin) look at mapbook for correct road and boat landing area. 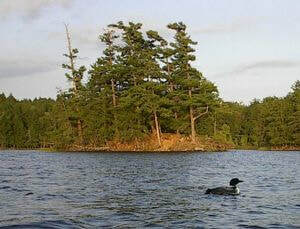 And, many other lakes to enjoy in the area in the Ottawa National Forest. Also, Bond Falls and more. FISHING LICENSES: Fishing licenses, boat rentals, bait, emergency gas in area. Sylvania Outfitters (not affiliated with Sylvania Outfitters) also has fishing licenses along with maps, lures, t-shirts, hiking and canoeing items and more. Or, some area gas stations sell licenses such as in Land O Lakes, etc. Bait is sold at Sylvania Outfitters, gas station in Land O Lakes, bait shop in downtown Land O Lakes, Bents Camp, Nine Pines on Lake Gogebic, etc. SNOWMOBILE STICKERS: Snowmobile stickers (as last checked) available at Rogers Bar (just down Old Highway 2 from cabin). FOOD, DRINKS IN AREA: Still have privacy and woods and also could walk to Rogers Bar (smaller country bar, down Old Hwy. 2 from cabin, cabin on acreage and not affiliated with Rogers Bar) for famous stuffed pretzels, other specials on sandwiches, Taco Tuesday night, bucket nights (Friday), pizza, ice, games, chips, drinks (relax and not have to drive), quiet type country bar. Sit and have WIFI and enjoy time sharing stories of fishing, snowmobiling, hunting, and more. Take the snowmobile or all terrain vehicle right out the driveway of the cabin to the trail and to Nordines Food Store for famous salsa or to the Cafe in town for breakfast to start your day out. Or, try boating or snowmobiling to Bent's Camp on chain (as featured on Discover Wisconsin) for homemade pizza-food or ATV-Snowmobile to many other locations. Chars Café in Bruce Crossing, MI (north of cabin) is a good place to stop for misc. menu items for breakfast, lunch, etc. or to stop on your sled, etc. And, there are some other restaurants in Bruce Crossing. Northwest of the cabin closer to Bergland is a barbecue place. Other restaurants and supperclubs in Land O Lakes and Marenisco. Restaurant guidesbooks in cabin. Stops for your sleds and all terrain vehicles or just siteseeing stops. Ice cream place by Paulding (north of Watersmeet). Trail to trail food to many restaurants and fun destinations. A good place to get area status information for snowmobiling and other area activities is Rogers bar down road from cabin (smaller country type bar). Rogers Bar also has pizzas, sandwiches, stuffed pretzels, ice, games and more. Cabin is on acreage, wooded area, circle driveway and with privacy trees, National Forest behind cabin rental, etc. Rogers Bar (cabin not affiliated with Rogers Bar) also has maps and stickers. MANY ACTIVITIES TO DO IN EVERY DIRECTION OF CABIN: Sylvania Wilderness Natural Area (beach, pavillion, hiking trails, wildlife, canoeing, etc. ), Lake Gogebic (largest lake in Michigan), Ottawa National Forest, Bond Falls, Kakabika Falls (close to cabin), Yondota Falls (just west of cabin closer to Marenisco), many other waterfalls (see waterfalls website for cabin), Porcupine Mountains (with Visitor Center also), Lake Superior, Mystery-Paulding Light, mining (even some where you can try some mining yourself or for the children), Ontonagon River areas, ski hills and ski trails, historic & haunted sites, historic old villages, museums (Land O Lakes, Ontonagon, Wakefield, etc. ), Watersmeet Trout Hatchery, ice skating rink in Land O Lakes, beaches at different sites (info. in cabin), shops in Land O Lakes, casino, ORV (ATV) trails, bike trails, siteseeing (mountains, rivers, wildlife, etc. ), snowmobile trails, Watersmeet Visitor Center, forestry office, casino, old railroad history (Watersmeet use to have a circular train station, etc., book has been written on it), National Copper Boulder site (where copper boulder came from for the National Museum in approx. 1840), sled dog races, radar runs, craft fairs, wildlife and bird watching and more. VISITOR CENTER: Visitor Center (government) in Watersmeet has movies-presentations every so often on wildlife-birds-trees-bears-wolves-etc. Visitor Center has displays, maps on the area, gift shop with fun items for adults and children, Christmas Tree permit information. There is also a Forestry Department (in a separate building close to the visitor center) for information on trails (or where you could ride off the trails such as for lower snow conditions, enjoying the National Forest and more). LAKE GOGEBIC: (which is west of the cabin in Marenisco area, take Stage Coach Road to the south lake boat landing; cabin is between the towns of Watersmeet and Marenisco). Largest lake in Michigan. The lake is in two counties and in two time zones and contains jumbo perch, big walleyes and small mouth bass, etc. Lake Gogebic encompasses 13,380 acres with 38 miles of beautiful shoreline. People enjoy fishing Lake Gogebic for different fish including Perch and the lake has a boat landing on the south side that is a reasonable proximity from the cabin. Chippewa name meaning 'Where trout rising to the surface makes rings on the still waters'. ALLIGATOR EYE: Just west of the cabin by Lake Gogebic. On M-64 and about 6 miles North of US Highway 2 (approx. 2 miles past the Gogebic County Park). Paved shoulder to park on. Trail through woods is approximately 1/2 mile. It is said that there is a bench 1/2 the way on the trail. Trail maker of a hiking trail to the trail. Beautiful bluff looking over Lake Gogebic (largest Lake in Michigan). With a historic story and information. The sign (when closer to the bluff) tells the story and information of the bluff and other information of Lake Gogebic. The quartz veins found on his site were used for quarrying efforts by ancient miners. BOBCAT LAKE PICNIC AREA: Bobcat Lake that is in the National Forest and just west of the cabin has a picnic area. And, a view of the lake and beach type area. Boat landing natural area also. LAKE GOGEBIC COUNTY PARK PICNIC AREA: View of the lake. Pavillion. Boardwalk type areas by the water. Just West of the cabin to the south side of Lake Gogebic. Boat landing area also. HENRY LAKE BOARDWALK AREA: Boardwalk area to walk by and in forward to lake. West of cabin. LAKES, LAKES AND MORE LAKES: Some people like to fish the chain, then fish some National Forest lakes and then Lake Gogebic. Great week of a variety of fishing. If one area is not biting then try the next. You won't be stuck at one lake or paying lake cabin prices. Save your money for fun in the area to do many adventures, enjoy some great food, shopping, etc. Stories also of Stage Coach Road having one of the last stage coach robberies with Black Bart. Snowmobile, canoe, fish, ORV two counties in one vacation. FISHING TOURNAMENTS, ATV RUNS, ETC: Area has ATV ORV runs, partridge (grouse) hunts, ice fishing derbies (Rogers Bar, Lake Gogebic Walleye tournament and others). See website for cabin for ATVing ORVing at www.fourwheelingwatersmeet.weebly.com. WIFI: WIFI available at Rogers Bar, library in Land O Lakes, cafe in Watersmeet in Nordines Plaza, etc. NATIONAL FOREST LAKES: There are many lakes in the National Forest areas also. And, in many directions from the cabin (so quite a few of them). Many of them not far from the cabin. Some between cabin and Marenisco area. So, make it a week and check out MANY LAKES OVERALL. Mapbook in cabin to use during your stay. Some are more hidden gems. Come explore and have some fun. Conveniently centered location to do many adventures. CISCO CHAIN OF LAKES: The Cisco Chain abounds with walleye, largemouth bass, smallmouth bass, northern pike, lake trout, musky, and panfish. 15 lakes and 271 miles of wooded scenic shoreline. The lakes are dotted with many islands and variety of waters including spring-fed waters offer excellent fishing. A state record musky was caught in the Cisco Chain of Lakes. GOLF COURSES: Watersmeet has a golf course off Hwy. 45. Land O Lakes has a golf course off of Hwy. 45 and downtown area (off Highway B). BIKING & HIKING TRAILS: The new bike trail includes all of Thousand Island Lake Road from the Watersmeet side to the Land O' Lakes side and connects with the many, many miles of trail. Trails also toward Marenisco, etc. (see Fall website on cabin for more information). TRAILS AND BRIDGE SYSTEM: The main snowmobile trail becomes our great ATV/UTV/ORV trails when it's not sledding season. Snowmobile or ATV (ORV, UTV, fourwheeling) over bridge system of the waterfalls. Take some beautiful photos. SYLVANIA WILDERNESS: There is the Ottawa National Forest but also the Sylvania Wilderness Area is a national forest with 21,000 acres of virgin forests and 36 unspoiled lakes (Sylvania Wilderness Area is closed to motor boats on most lakes, but it is available to the public for canoeing, picnicking, hiking, fishing, swimming, snowshoeing, skiing, etc.). Great lake for swimming at Clark Lake in the Sylvania Wilderness area (and there are some others). Sylvania Wilderness Area is just east of the cabin off of Highway 2, down Thousand Island Lake Road, and then to your left is the entrance with parking, etc. SKIING, SKIJOURING & SNOWSHOEING: Cross country ski trails just east of cabin by Sylvania by town of Watersmeet, by Sylvania Wilderness. Ski rentals also available. Warming area and more. Some other cross country ski trails listed on the Winter website (www.winterstickleybeaverlodgegetaway.weebly.com). Skijouring and snowshoeing information also on Winter website for cabin. Downhill skiing to the west and east of the cabin, great day trip. RENTAL EQUIPMENT IN AREA: Snowmobiles-All Terrain Vehicles-paddleboards-fishing boats-pontoon boats-canoes-kayaks-bikes-snowshoes, cross country skiis, etc. Snowmobile-fourwheeler, etc. dealership in Watersmeet for parts, mechanic, clothes. Some other dealers south of Watersmeet and just northwest of Watersmeet. See other cabin websites for listings of dealers. MAPS, MAPBOOKS, INFORMATION: Great map of the chain in the cabin showing other boat landings on Cisco Chain of Lakes. Mapbooks in the cabin showing other National Forest Lakes, Lake Gogebic, MI Trale (trails, rivers, more) and more. FIREWOOD PLACES: for sale at Sylvania Outfitters (bundles with kindling approx. $4 and also for sale closer to town on right hand side by Watersmeet (off Hwy. 2 going to Watersmeet; you will see construction equipment there also). Another place in Watersmeet closer to the Cenex gas station to the left. Or, get a firewood permit and use some of the downed trees and branches in the area behind the cabin on Ottawa National Forest (at your own risk in entirety). STORES AND TOWNS: Grocery store, Family Dollar store, gas stations, café, visitor center, laundromat, post office, police station, new clinic in Watersmeet (east of cabin). Marenisco (west of cabin) has gas station with supplies, laundromat, café, library, supperclub & bar, clinic, bars with food, baseball softball field. Hospitals in Eagle River, WI (south), Iron River, MI (east) and Ironwood, MI (west) are the closest ones to the cabin. Other store for supplies in case you forgot are: Ironwood, MI (west of cabin) that has a Walmart with misc. outdoor gear; Eagle River, WI (south of the cabin) has Shopko for misc. department items; Bruce Crossing, MI has Settlers Coop which has outdoor gear, groceries. 2 COUNTIES: The cabin is just north of the Wisconsin Border Area. It is in Gogebic County, MI (Watersmeet Township, west of the town of Watersmeet approx. 11 miles and east of the town of Marenisco approx. 11 miles) and just north or northwest of the cabin is Ontonagon County. Just north of Beatons Lake approx. is the county line. The counties have had sightings of moose, elk, wolves, coyotes, turkeys, eagles, variety of other birds and wildlife. There is a restaurant in the White Pine area that feeds the black bears. Bringing a camera is a good idea to record the beauty of the area along with the experience of seeing the many birds, fantastic loons, and eagles soaring as well as all the wildlife animals in their natural setting. Come enjoy the area, make your own adventures, relax your spirit, heal your heart, calm the mind and find peace in the nature and moments of the wisdom of the divine earth's beauty. Enjoy two counties during your stay. The Central time zone changes just north of the cabin. Some enjoy New Years Eve within two time zones (and celebrate twice if you want). Rental rate $159 per night base rate (based on 10 guests; sleeps 16 approx.). Only $5. per guest per night over 10 guests. 3 night minimum; unless agreed upon during slower times for 2 nights; for parties ask about a flat rate per night fee; no security deposit or nonrefundable security deposit charged to book reservation; $29 pet fee (one fee, stay covers all pets within reason); cleaning, garbage and initial supply fee of $99 (one fee, stay); 1/2 down (of total) holds your dates and reservation with completed cabin reservation form; other 1/2 due two weeks before your stay (unless other arrangements). (920) 680-7095 or (920) 530-6401. Call (leave message) or text. Winter activities (snowmobiling, skijouring, snowshoeing, cross country skiing, ice fishing, radar runs, dog sled races, siteseeing, fat tire biking, tubing, ice skating, hunting, etc.) helpful tips, Winter pictures, helpful hints on emergency and gas station information, trail information (trail markers) and much more (please make us aware if information changes). Canoeing, kayaking, waterway information, outfitters or equipment, MI-TRALE information, etc. ATVing (or ORVing, fourwheeling, UTVing), MI-TRALE information, etc. Information on Ontonagon River, boat and canoe rental listings, lakes of the Cisco Chain, Kakabika Waterfalls (off Ontonagon River west of cabin), Lake Gogebic information, National Wild and Scenic River System information, Fishing Ontonagon River Areas, etc. Waterfalls in vicinity of cabin. Among the waterfalls. Including Marenisco (west of cabin). Great Early Winter and Spring Waterfalls Siteseeing. ORVing (ATVing, UTVing, fourwheeling), fishing and tournaments, festivals, bingo, birdwatching, presentations, waterfalls, Memorial Day services, shopping, siteseeing, hunting, arts and crafts, restaurants, canoeing, book club, ice out party, classes, book sale, Easter buffet, Mother's Day and Father's Day relaxing, Fireflies area garage sales, trout season, fresh produce days, see Fall website for hiking and biking and trails information, more. TEMPERATURE CHANGES: Good to bring a variety of clothing with you. Even in Summer at times nights can be very cool. Or, with weather changes. Curtains-drapes-blinds in cabin to help keep it cooler in Summer and warmer in cold months. For the Winter the cabin has alternate heat sources.